A species of microscopic algae that caused "red tides" in Monterey Bay last summer, discoloring the water and killing mussels, is still present in water samples from the bay and has the potential to cause more serious problems, according to scientists involved in a Central Coast ocean monitoring program. 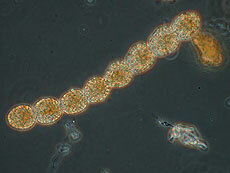 Cochlodinium catenatum, a species of microscopic algae that caused "red tides" in Monterey Bay last summer, discoloring the water and killing mussels, is a type of dinoflagellate. 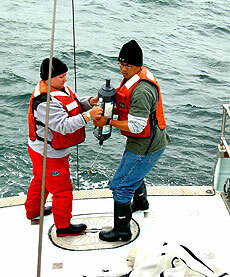 UCSC researchers Atma Roberts and Itchung Cheung collect water samples from Monterey Bay during a ship survey in August 2004 on the R/V John Martin. "This species has been seen before on the Central Coast, but never in the numbers we've seen in the past year, and we are still seeing it now. Its presence is so unusual and persistent, and its blooms so dense, we suspect it is signaling a change in our coastal waters," said Mary Silver, professor of ocean sciences at UCSC. While Silver and other scientists around Monterey Bay are keeping a close eye on the situation, they noted that federal funding for the programs that support this kind of monitoring effort is increasingly uncertain. The alga has been tentatively identified as Cochlodinium catenatum, a species that has caused fish kills and other damage in the coastal Pacific waters of Mexico and Central America. A closely related species, C. polykrikoides, has killed fish in salmon farms in Vancouver, British Columbia, and has caused severe damage to fish farms in the coastal waters of Korea, China, and Japan. Silver's lab has been monitoring Cochlodinium in Monterey Bay since first noticing it in July 2004. The researchers measured concentrations of the algae as high as 50,000 cells per liter in water samples taken last summer. Where dense blooms of the algae occurred, the waters were "slimy" and foul-smelling. Although toxicologists have not isolated a specific toxin from C. catenatum, the slime it produces has been associated with the deaths of fish and corals in Pacific waters of Panama and Costa Rica, where blooms occurred in the 1980s, Silver said. Records from the 1960s and 1970s indicate that blooms of this organism were also noted in the San Diego area, she said. Gregg Langlois, who oversees the California Department of Health Services (CDHS) marine biotoxin monitoring program, said C. catenatum was first identified on the Central Coast in 1997 when it bloomed near San Luis Obispo. The recent findings in Monterey Bay were confirmed by Chris Scholin, an expert on toxic algae at the Monterey Bay Aquarium Research Institute, and scientists at the Moss Landing Marine Laboratories. As part of Silver's monitoring efforts, carried out in conjunction with Langlois's statewide program, bags of mussels are hung in the water below the Santa Cruz Wharf and checked every week to monitor for toxicity. The mussels began to die when C. catenatum showed up, and continued dying for about five months, Silver said. "Up until about a month ago we were still getting dead mussels," she said. "The algae produces some substance that is nasty, but it is likely to take a while for scientists to nail down exactly what that is." Langlois said there is no evidence of any human health effects associated with Cochlodinium blooms. Analyses of tissue samples from affected mussels have not indicated the presence of any known algal toxins, he said. "We're not certain what the mechanism is for the deaths of mussels, but there is no evidence that these algae produce a toxin that affects mammals or birds," Langlois said. Kenneth Coale, director of Moss Landing Marine Laboratories, said the Cochlodinium bloom provides a good illustration of the need for coordinated efforts to monitor ocean conditions along the coast. "Without coastal observatories, we might have missed this until we had a major fish kill or other type of ecological damage," Coale said. "What is striking to me is that these blooms may signal coastal climate change, invasion of new species, or both. We need long-term measurements in order to understand what factors contribute to these blooms, whether they are natural or the result of human activity, and what might be done about them." Silver's monitoring work is supported by UCSC's Center for Integrated Marine Technologies (CIMT), funded through the National Oceanic and Atmospheric Administration (NOAA) as part of the agency's Coastal Ocean Technology System (COTS). But funding for CIMT, an interdisciplinary effort involving five partner institutions around Monterey Bay, has not been renewed for next year. "The marine science institutions all around Monterey Bay are working together to organize an integrated ocean observing system for the Central Coast, and we are trying to move forward in a very uncertain funding climate," said Donald Croll, assistant professor of ecology and evolutionary biology at UCSC and codirector of CIMT. Moss Landing's Coale is involved in CIMT and also oversees a related NOAA-funded program, the Center for Integrative Coastal Observation, Research, and Education (CICORE). CIMT and CICORE are developing complementary ocean monitoring technologies as part of NOAA's efforts to establish a Central and Northern California Ocean Observing System (CeNCOOS). Establishing an integrated ocean observing system is among the key recommendations of a major report issued last year by the U.S. Commission on Ocean Policy, but funding to implement the commission's recommendations has not yet been authorized. According to Croll, the need to implement the commission's recommendations on ocean policy will only become more urgent with increasing coastal development and growing human impacts on coastal waters. "With a harmful algal bloom, you can't see how it develops over time unless you're out there sampling all the time," Croll said. "Because of the coordinated efforts of marine scientists around Monterey Bay, this is probably one of the most closely observed ocean ecosystems anywhere, and we want to see that continue." On Saturday, March 12, the Monterey Bay National Marine Sanctuary holds its annual Sanctuary Currents Symposium at California State University, Monterey Bay. This year's theme is "Tracking the Health of Our Sanctuary." For more information, see http://www.mbnms-simon.org. This sanctuary web site also has links to additional information about monitoring programs in the sanctuary and harmful algal blooms.